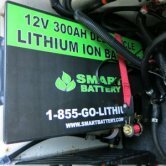 In July 2014, we installed a 300AH Lithium-Ion "SMART™ Battery” in our RV, replacing all 4 Coach 6 Volt AGM batteries. We also had to upgrade the Inverter to the current "software” which really was a circuit board exchange and that also required an updated Inverter control panel. We are still looking for a solution to the RV’s Onan Auto Generator Start (AGS) system which will be able to start the generator at a higher voltage threshold than was required using the original AGM batteries. Since Lithium-Ion Batteries run about 1 volt higher than conventional batteries, a low Lithium-Ion Battery seems to the AGS system to be a fully charged conventional battery. So far I have been unsuccessful. I like the "SMART™ Battery” very much. It runs about 1 Volt higher and everything seems to operate more efficiently. In fact we had the opportunity to test the system recently. I decided I was going to leave the inverter "On” and use all electrical items that we use just as if we were plugged in. The only exception was we operated only one TV and did not turn on the surround sound system. There are 3 TV’s in total in our RV, so we had one operating, two in standby mode. We have two satellite receivers, one operated while another was powered in standby mode, two Home Theater systems, both in standby mode. We have LED lighting so there is less drain from them. The fridge, and water heater use LP with 12V control boards. The microwave was not used but the clock and display were on. We were able to recharge a Surface Tablet and an iPad, and I am sure there were various other relatively small parasitic loads. The TV was on for a total of 7 hours in 19 hours. Everything functioned as expected. We started out at 13.7V (the typical voltage reading for a fully charged "SMART™ Battery” and after all of that usage, it was down to 12.8V (dead in "SMART™ Battery’s” parlance. We fired up the 8KW generator and within 3.5 hours we were back to a float charge. I felt that was a very rigorous test since we would typically turn off the Inverter when we were not using it to power a needed 120 volt item. The parasitic loads are significant due to the ‘instant on’ feature found on most modern day electronic goods. We have a friend who has a Lithionics® brand Li-ion battery and he has a fireproof wrap over his battery. The other thing that I like is that the chassis battery (a 12 Volt AGM Battery, replaced in January, 2014) seems to be fully charged all the time, which means it spins over the diesel engine very quickly. This is a vast improvement over the former battery system which required much more time to charge and seemed to never be fully charged. This meant that the inverter did not devote as much power to the Chassis battery which I believed shortened its life. If you can justify the initial cost, I believe that the benefit of not having to replace batteries every few years, will make the cost of ownership balance out over time. I also think issues such as eliminating the effects of corrosion and reduced failure of electric motors and components also adds value to the equation. Given the greatly extended charge/recharge cycles combined with far more of them (2,000-3000 versus 300-500) before reduced output (80% after 2,000 cycles) provides a great incentive to consider the conversion as well. With all of the electric and electronic demands being placed on batteries in newer RV’s, I think it is time for RV makers to begin offering these alternative power systems, especially in flagship top of the line models. 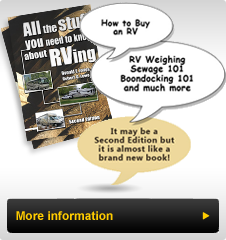 It will require some increased knowledge at the RV engineering and Technician level, combined with some re-education of the RV owner, however the long term value will make it all worthwhile.